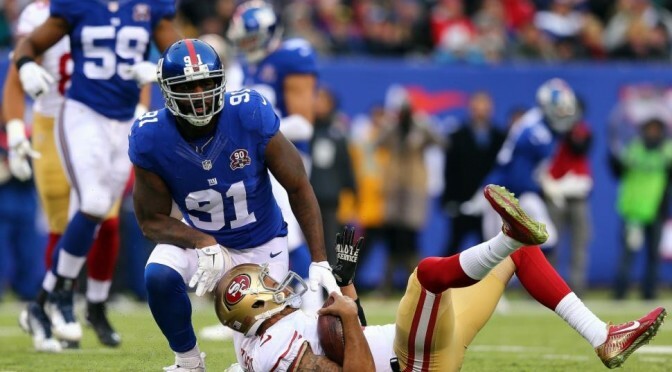 If the first 2 weeks of this season are any indication, New York got a steal in Robert Ayers. Despite Tuck having 12 sacks last season to Ayers’ five, the two players’ underlying production was strikingly similar. Adjusting for their snap totals, both were in the Top 10 at their position with an identical 10.4 Pass Rushing Productivity rate. And though Tuck made his biggest mark last season against the run, Ayers’ had a higher run defense grade and posted the second-best Run Stop Percentage of any starting 4-3 DE. This season, Ayers has slid into Tuck’s role with great success. With three sacks and two QB hurries on just 30 pass rush snaps, he has the second-highest Pass Rushing Productivity of any 4-3 DE. But that’s a bit misleading, because 43.1% of his snaps have actually come inside at defensive tackle, taking Tuck’s old role in the Giants NASCAR package. He’s also graded well against the run, and has the seventh-highest overall grade at his position. New York entered this season with a lot of questions at defensive end, but it looks like Ayers has answered some of them by stepping in seamlessly for their former captain.